There comes a time when you just have to decide to do what you want to do. Instead of sitting there waiting for the perfect opportunity or the perfect amount of funds, sometimes you just have to go for it and let God lead you. My goal is, Lord-willing, to go to Japan for 3 months in 2018 to study and travel! It may be that the timing in my plan is not the timing in his (and that’s okay, because he knows better than I do! ), but I want to start taking the steps needed now, because it’s time I get serious! And I want to take you along with me for the whole process, from the planning to the financials, the trip and everything in between. First up is deciding the basics: where, when, and what. 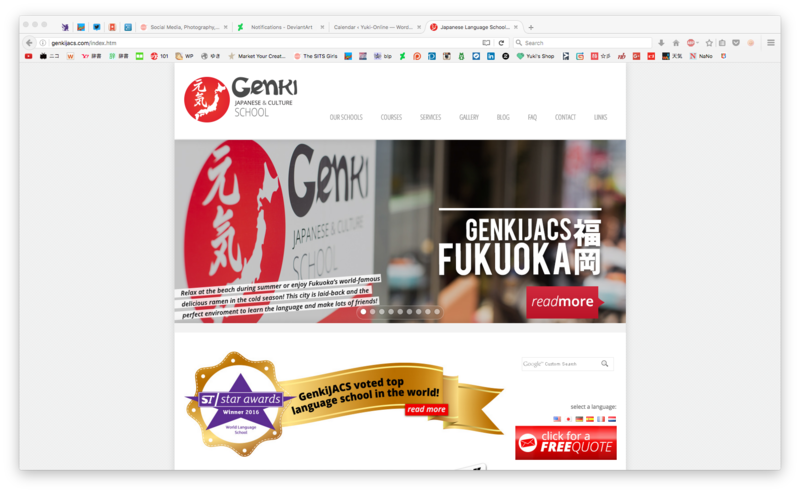 Screenshot of GenkiJACS’ homepage! Congrats on winning the Star Award, Genki!! I decided on GenkiJACS several years ago, when I first decided I wanted to go to Japan, because they seem very friendly and I’ve heard lots of good things about them. This year they even won the prestigious Top Language School Star Award! They cater more to students from Western countries (non-Asian languages) so they are able to help our specific needs and challenges, which I think is wonderful, because we definitely have some–such as not having a background in kanji. Their classes are smaller, which is reassuring to a shy person like me, who prefers to get to know a few people at a time rather than all at once! And I really appreciate how much they are willing to help you, beyond just getting adjusted to the city; they will help you plan weekend trips, recommend places to go, and more. It seems like they work really hard to make sure you don’t have to worry about anything but having fun and learning Japanese! I’ve decided to attend their Fukuoka location because it’s not as crowded as Tokyo (I don’t want to be overwhelmed! ), but still offers a lot, and is less expensive. Early 2018, from January to March/April. Winter is the cheapest season to travel to Japan (especially regarding flights). I would rather not spend my birthday and Christmas there without my family, and in order to leave Japan before then I would have to arrive in August–a more expensive travel month. So early 2018 it is! Cheaper than the Plus courses, I can get the same base and just pay to join in on the extra classes/cultural experiences I’m interested in. I go back and forth between wanting to do a homestay and wanting to stay in a dorm, but I think the dorm would end up being best for me. As an introvert, I need to retreat from the world to recover from a day of social interaction. XD While a homestay would be lovely, I think I would get stressed out about imposing on the family or doing something wrong–and wouldn’t really be able to retreat as much as I would in a dorm. Once I feel more confident in my Japanese ability, I would like to visit Tokyo with my family, hopefully after showing them my favorite spots in Fukuoka. That would take around a week. Doing 10 weeks of study should allow me to avoid the busy season, which starts in April. With respect to food and spending money, I am more likely to save than spend, so I don’t anticipate needing any more than $1450 for three months. Of course, when my family comes to visit, they will pay for their flights and we can all share the cost of accommodation. Adding in some other estimates, this roughly comes out to around $10,000 USD. I will have to save up about $625/month from October 2016 to January 2018. I’ll do some more research to refine the budget more. I may not really need a regional rail pass, for example, but I want to know what that would cost just to see. I always like to budget on the higher end of things just in case! If you have any tips on planning a study trip like this, especially if you’ve studied at GenkiJACS before, let me know! I’d love to hear how it went and what you did. Congrats on the decision! If you aren’t already, head over to WaniKani and start studying kanji. It’s the one thing I wish I’d done before moving to Japan. Life was so much easier being able to read. Genki is awesome, great choice! Especially Fukuoka, yay! Yes, I really debated over it, but I think I feel more comfortable with this choice. Yeah, my wife and I were studying at FFLC, a really horrible school in the area of Hakata. We had to leave because it was soo bad, and now they’re extorting us by having to pay them $5,500 just to get a letter transfer, even though there is no signed agreement to do so… I’m very grateful to have Genki in the area so we can possibly finish off our 2 years here.